The North Mississauga Soccer Club is a non-profit, volunteer directed, professionally managed community club providing year-round programs to players across Ontario. At NMSC we rely on dedicated volunteers to help make our organization successful. We simply could not function without you… Your assistance and commitment is invaluable! 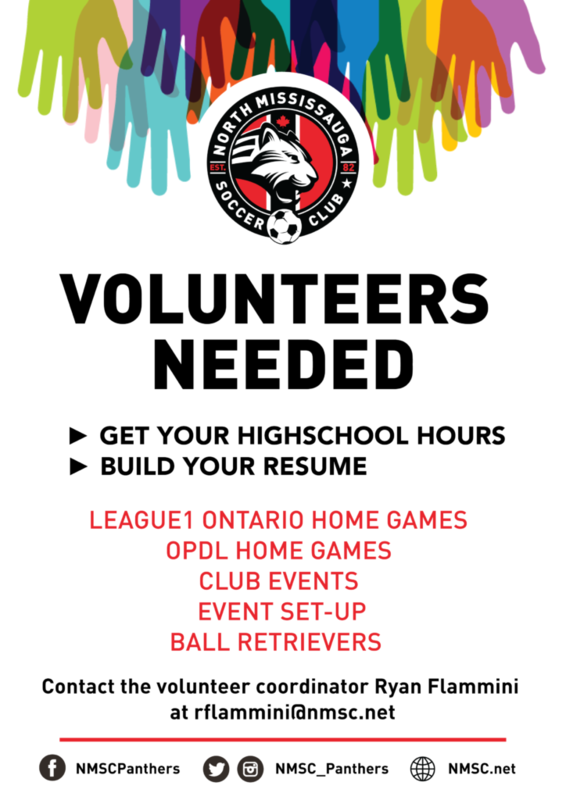 We offer a range of volunteer opportunities at League1 Ontario and OPDL home games. These games are played outdoors from April to September on Wednesday, Thursdays, Fridays, Saturdays, and/or Sundays. The Volunteer Schedule 2019 is now available! If you are interested in volunteering with the North Mississauga Soccer Club please review the volunteer schedule contact the Volunteer Coordinator, Ryan Flammini, rflammini@nmsc.net with the dates you are available to volunteer. 1.) You are doing good for others and the community, which provides a natural sense of accomplishment. 2.) Your role as a volunteer can give you a sense of pride and identity. 3.) Volunteering doesn’t have to involve a long-term commitment or take a huge amount of time out of your busy day. Giving in simple ways can help those in need and improve your health and happiness. 4.) Volunteering connects you to others. It strengthens your ties to the community, exposing you to people with common interests through fun and fulfilling activities. 5.) Volunteering can advance your career. Whether you are completing the mandatory hours to graduate high-school or building your résumé, volunteering will help guide you in the right direction. Thank you to all of the volunteers that help make NMSC successful: Coaches, Managers, Parents, Event Volunteers, Interns, Students, & Board of Directors!